Le Vent du Nord. Used by Permission of Le Vent du Nord. Revisiting the stack of CDs I brought back from Folk Alliance 2013 reveals that there are more interesting Canadian acts I haven't shared with readers yet -- which is fitting, since the meeting was in Toronto. 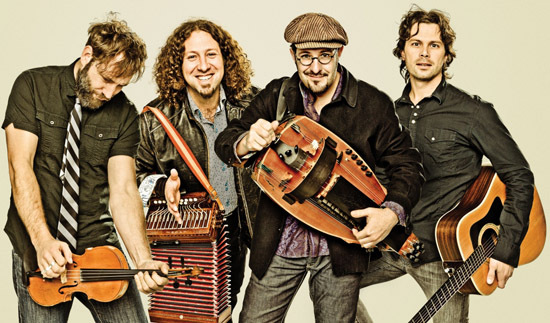 I'll begin with one of the more illustrious groups, Québec's Le Vent du Nord. The title of their 10th-anniversary CD, Tromper le Temps (Cheating Time), can be seen as an allusion to the band's maintaining youthful energy in defiance of its long history. The album finds the band cooking up a sophisticated sound out of Québec folk roots, with liberal helpings of old-world French music (musette and folk), jazz and pop. Most of the material is original, but written in the spirit of traditional folksongs and fiddle tunes. You'd be hard-pressed to find a more mature, complex, or well-played album coming from the Québec scene. Outstanding tracks include "Le Coeur de Ma Mère," a literally heart-rending tale of matricide lifted from a 19th-century novel; "Lettre à Durham," a consideration of Québec politics, past and present; and "Le Diable et Le Fermier," an adaptation of an old folktale to the current political debates on shale oil. From upbeat fiddle tunes to contemplative airs, the instrumentals are impeccably played on fiddle, hurdy-gurdy, button accordion, guitar, piano, bass, mandolin, and the precision foot-percussion the Canadians call podorythmie. All the pieces are arranged with care and polished til they sparkle. Here's a video version of "Le Diable et le Fermier" on which the band is joined by two other groups, Les Charbonniers de L'Enfer and Galant Tu Perds Ton Temps. Toronto bluegrass bandThe Slocan Ramblers have only been entertaining audiences for a couple of years, and Shaking Down the Acorns is their debut album. On it, they pay homage to great teams like the Monroe Brothers and the Stanley Brothers, present some nice original tunes, and even play a few old folksongs. With so many American covers, it's nice to hear them do "The Hallelujah Shore," a great song on a Canadian theme by Kevin Breit...but Hank Williams's "Weary Blues for Waitin'" and "The Law and Lonesome" (a song co-written by North Carolina's Jonathan Byrd and Toronto's Corin Raymond) are a lot of fun too. The album bounces smoothly along at a nice clip; you'll tap your foot and nod in appreciation at a ringing banjo here, a bell-like guitar or brisk mandolin there. The solo vocals can be a little thin, but the harmonies on such pieces as "I'm Coming Back (But I Don't Know When)" are spot-on and tasty as they come. This is an excellent album, all the more for being a debut disc, and well worth repeated listening. Jason and Pharis Romero. Photo by Mike Melnyk. Used by Permission of Pharis and Jason Romero. Pharis and Jason Romero occupy the same old-time/country blues middle ground enjoyed by Lauren Sheehan. 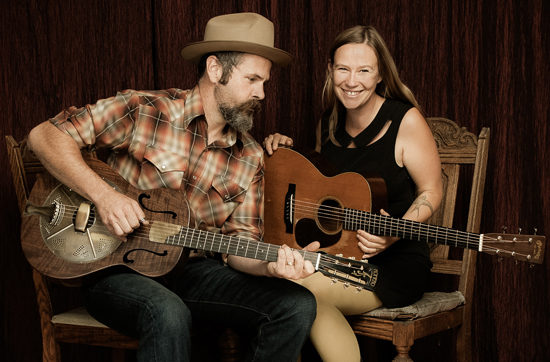 Their second duo CD, Long Gone Out West Blues, follows a debut that won an Independent Music Award and a Canadian Folk Music Award. They bore up under the pressure, releasing another superior slice of what you might call "North Americana." About half the songs are self-penned and half are older, either traditional folksongs or country numbers from the early 20th century. You'd be hard-pressed to tell which are new without consulting the booklet. They take it one step further, too: they play a combination of 1930s and 40s Martin guitars, and resophonic guitars and banjos they built themselves in their studio in (can't make this stuff up) Horsefly, B.C. My favorites are a quietly intense rendition of "It Just Suits Me," learned from this Alan Lomax field recording, and "Wild Bill Jones," learned partly from Dock Boggs. But their self-penned title song, "Long Gone Out West Blues," isn't far behind. Powerful close-harmony singing, bright solo vocals by Pharis, precision picking, and a lonesome, laid-back vibe, make this perfect for close listening, but also for playing in the background of your daily life -- whether that's paying bills, housecleaning, or even making banjos. Karen and Maureen Ennis. Used by Permission of Ennis. For the latest in fiddle-driven jazz-rock Celto-funkadelica, check out Nova Scotia's Sprag Session. Fronted by Cape Breton fiddler Colin Grant and backed by a rock-solid rhythm section, a talented and playful pianist, and a multi-instrumental whiz kid, this band puts monster energy into its eponymous debut. If you're into Celtic music, think Ashley MacIsaac, Shooglenifty, Wolfstone, and a little New Celeste. If you're not, think Bela Fleck but with Scottish fiddle instead of banjo. This band electrifies its renditions of dance tunes, funkifies them, and spins them out into epics by adding passages of controlled jazz improvisation. It takes a lot of raw talent and a lot of discipline to make an album like this hang together, and these guys have done a great job. It's a truly impressive debut and speaks of great things to come.